A group of five co-workers at the Kanawha Emergency Ambulance Authority from West Virginia are celebrating after their Megamillions ticket gave them a million dollar return on investment. Each member of the group contributed $5 to buy 25 tickets, the winning ticket among them; it was just the first time they played together! But when Brenda Rader told her group that they had won, the others initially thought she was playing a cruel joke. 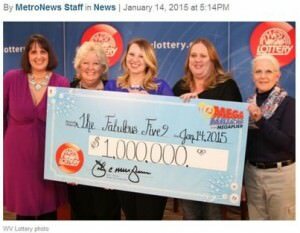 But one of their entries really bagged the first million-dollar lottery jackpot in the state in the Jan. 5 draw, so each member of the group received $137,000 at the lottery offices last Wednesday. While all the women are happy, they have different plans for the money which range from paying off student loans, to just keeping it in a bank. Rader purchased the winning ticket from the One Stop #101 in South Charleston.